Great purchase on my part, great product on CEP part. Will be a repeat purchaser without a doubt. Thanks. Love the little zipper on these reusable folding tote bags. Great fit for my business. Thanks for everything. Never EVER had a bad experience using Custom Earth Promos. Custom-made and reusable bags that are great for the environment. The print my company wanted on these custom-made bags came out superb. very happy with my companies purchase and will be back for more eco-friendly bags before you know it! Everyone who made a purchase of over 50$ during the holiday season received one of these bags from us. We are a sporting goods store (mom an pop) and to try an compete with the big guys I need to always do promotional things like this. I have used them many times and they even help me come up with ideas. Awesome company! Extremely happy with their services! Custom Earth Promos is a great eco-friendly company. I have been working with them for 2 years now. Each bag or bottle I get from them is made well and arrives on time!! My customers love this bag. Nice bag, good idea how it zips up. Great buy, I will be a repeat buyer. Never had a bad experience with them. Five star rating from my staff and I.
I am very happy with my purchase, the print is very clear and it is constructed very well. I used this as a free gift at our industry showcase. The customers who got a bag loved it. Green reusable bags are the future, we all need to use them, this is a good bag to start the reusable bag movement! CEP has a very user friendly website. I got my quote instantly from there site. I worked with there design team and it was a great experience I suggest this to all design novice consumers. Afforable and there service is great, I love there staff. Durable and sooo many colors that are offered. Great options. This bag is so cool, you can zip it up and carry it on a key chain. It is very lightweight and durable perfect for some who travels a lot like my customers. I ordered multiple colors of this bag, all came out great we also did multiple colored prints on each bag. All function the way they are suppose to and the prints are good. I am looking forward to handing this out at our grand opening. With ultimately cool storage options and carrying capabilities, Custom Earth Promos' Reusable Folding Tote Bags are a cost-effective and environmentally conscious way to market your brand. With a large size of 18" width and 15 3/4" height that easily folds away into the zipper pouch and carried on a key chain, these foldable totes are modern, convenient and versatile. The imprint area of 8" width and 8" height is designed to achieve optimal brand exposure. Promote your business while engaging and building personal connections with your customers. By utilizing customized reusable bags, you invite your customers to join you in playing an active role in preserving the environment. 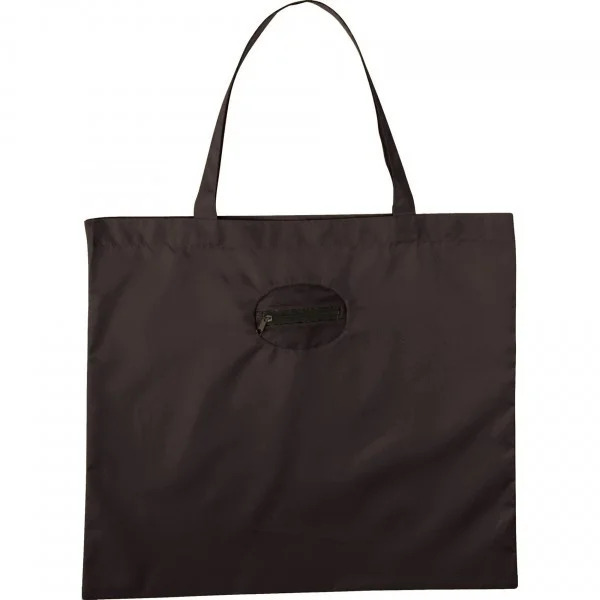 Strengthen both exposure and eco-consciousness of your brand with Reusable Folding Tote Bags. Increase the brand awareness and recognition of your business with high-quality imprints of your company name and logo. Fit for multiple promotional uses within such industries healthcare, hospitality, beauty, retail, food and wine industries, these large multi-purpose foldable totes can be used as reusable gift bags for company holiday parties, loyalty rewards for return customers, company events, promotions, fundraisers, giveaways and as complementary gifts for guests or VIP clients. Custom Earth Promos offers six vibrant color options for your Reusable Folding Tote Bag order. 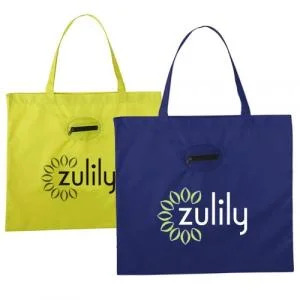 Available in lime green, royal blue, orange, purple, red and black, these totes are an awesome way to combine impressive aesthetics and functionality to market your business, charity or cause. Select the color that appeals to your specific brand needs or work with our expert design team to mix between two or more colors. These reusable totes can be customized in a multitude of ways to promote businesses such as hotels, hospitals, spas, resorts, restaurants, and clothing stores. The stylish and convenient design offers an attractive option for customers and employees alike to carry their folding tote wherever they happen to travel, ensuring optimal brand exposure and increased awareness among each person and place they visit. Create eye-catching graphic imprints unique to your brand with the help of Custom Earth Promos' design team. Use these imprints to express your brand values and messages. Our Reusable Folding Tote Bags are both an eco-conscious and fashionable way to stand out from the crowd and overshadow your competitors. Feel confident knowing that by working with Custom Earth Promos, you are assuring the guaranteed safety of your customers. All of our products are California Proposition 65 compliant, free of harmful contaminants such as chromium, cadmium, and mercury. Showcase your company's creative side by customizing the fabric color to complement your logo and color scheme. Increase the thickness of the material for added durability, add insulation or pockets to your custom bags or even adjust the dimensions to meet your specific needs. Get premium graphic imprints with the edge-to-edge printing option. Whatever the look is you want to achieve with your Reusable Folding Tote Bags, Custom Earth Promos will make it happen. With our competitive prices and years of industry-leading experience in environmental packaging, marketing your brand just became easier and more effective than ever!